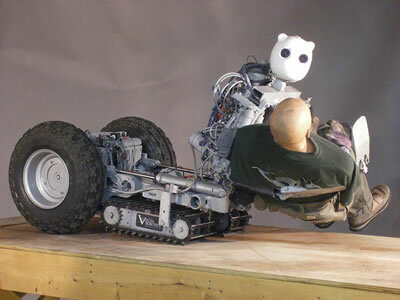 A prototype version of the Vecna BEAR (Battlefield Extraction-Assist Robot) is now undergoing testing. This remarkable robot is about the size and shape of an adult man. The Vecna BEAR should be able to rescue injured people in dangerous areas and then bring them back to safety. The proof-of-concept version shown above is able to maneuver easily in a variety of environments. On level ground or pavement, the Vecna BEAR can move quickly on wheels in an upright position (see Vecna BEAR rears up). In what the developers call the "centaur" posture, the robot glides along on the caterpillar treads on its "belly." The BEAR requires control that is better than that commonly seen on backhoes or tractors, both machines with hydraulic systems to provide the muscle. The BEAR's objectives require fine-tuned control, and a more gentle touch, such as that found in proportional control systems like PWM control over standard motor actuation systems. For this challenge, Vecna engineers are designing a control system that will permit very finely resolved proportional movement. New specialized micro hydraulic valves and related systems are being invented by this team of young engineers, and are expected to be patented. The Vecna BEAR's humanoid form allows it to be used in urban environments; the BEAR can climb stairs, pass through doorways, all with an adult-sized dummy "casualty" in its arms. 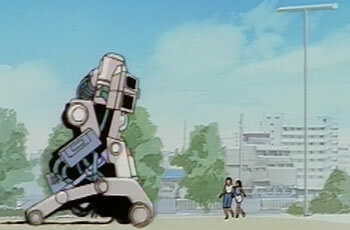 Science fiction fans may recall the Japanese manga film Roujin Z, introduced in 1996. In the film, the Ministry of Health orders Takazawa Kijuro, an elderly bed-ridden man seemingly without family, to test a new robot - the Roujin Z-0001. A self-contained atomic power reactor gives this unique part bed/part machine robot all the energy it needs. Roujin Z can also climb stairs and carry the sick. See the previous coverage of this robot at Vecna BEAR Battlefield Extraction Robot. For another "centaur-style" robot, take a look at NASA's Robonaut Centaur, which I saw demonstrated at NextFest 2006 last fall in NYC. Read the excellent story at BotMag.